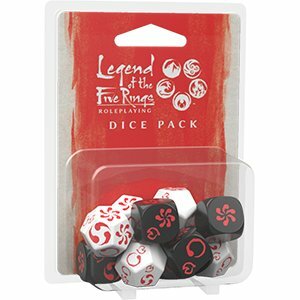 Legend of the Five Rings Roleplaying uses a set of custom dice to determine the success, failure, strife, and narrative opportunities generated by every test. Legend of the Five Rings Roleplaying uses a set of custom dice to determine the success, failure, strife, and narrative opportunities generated by every test. Custom Legend of the Five Rings Roleplaying Dice come 10 to a pack and allow GM’s to quickly interpret results of skill checks, determining success and failure and expanding on narrative opportunities through opportunity and strife! In the land of Rokugan, the Emerald Empire has lasted for a thousand years. The centerpiece of the Game Master's Kit is the GM screen.